The following sections present advanced topics related to the initialization and validation features of the Traits package. This method initializes the name trait attribute, returning its initial value. The method overrides any default value specified in the trait definition. It is also possible to define a dynamic method for the default value in a trait type subclass (get_default_value()). However, using a _name_default() method avoids the overhead of subclassing a trait. In this example, the salary_grade of the Employee class is a range from 1 to 10, with a default value of 1. In the Manager subclass, the default value of salary_grade is 5, but it is still a range as defined in the Employee class. In this example, a trait named coefficient is defined externally to the class quadratic, which references coefficient in the definitions of its trait attributes c2, c1, and c0. Each of these attributes has a unique value, but they all use the same trait definition to determine whether a value assigned to them is valid. In the preceding examples in this guide, all trait attribute definitions have bound a single object attribute to a specified trait definition. This is known as “explicit” trait attribute definition. The Traits package supports other strategies for defining trait attributes. You can associate a category of attributes with a particular trait definition, using the trait attribute name wildcard. You can also dynamically create trait attributes that are specific to an instance, using the add_trait() method, rather than defined on a class. These strategies are described in the following sections. This example defines a class Person, with a category of attributes that have names beginning with temp, and that are defined by the Any trait. Thus, any part of the program that uses a Person instance can reference attributes such as tempCount, temp_name, or temp_whatever, without having to explicitly declare these trait attributes. Each such attribute has None as the initial value and allows assignment of any value (because it is based on the Any trait). of 'middle age' <type 'str'> was specified. In this case, all Person instance attributes can be created on the fly and are defined by the Any trait. If an attribute name exactly matches a name without a wildcard character, that definition applies. Otherwise, if an attribute name matches one or more names with wildcard characters, the definition with the longest name applies. Note that all possible attribute names are covered by one of these two rules. The base HasTraits class implicitly contains the attribute definition _ = Python. This rule guarantees that, by default, all attributes have standard Python language semantics. In this example, the Person class has a temp_count attribute, which must be an integer and which has an initial value of -1. Any other attribute with a name starting with temp has an initial value of None and allows any value to be assigned. All other object attributes behave like normal Python attributes (i.e., they allow any value to be assigned, but they must have a value assigned to them before their first reference). name: Must be a string; its initial value is ‘’. age: Must be an integer; its initial value is 0.
weight: Must be a float; its initial value is 0.0. All other object attributes are explicitly disallowed. That is, any attempt to read or set any object attribute other than name, age, or weight causes an exception. Because the HasTraits class implicitly contains the attribute definition _ = Python, subclasses of HasTraits by default have very standard Python attribute behavior for any attribute not explicitly defined as a trait attribute. However, the wildcard trait attribute definition rules make it easy to create subclasses of HasTraits with very non-standard attribute behavior. Two such subclasses are predefined in the Traits package: HasStrictTraits and HasPrivateTraits. This example defines a TreeNode class that has three attributes: left, right, and value. The left and right attributes can only be references to other instances of TreeNode (or subclasses), while the value attribute must be a string. Attempting to set other types of values generates an exception, as does attempting to set an attribute that is not one of the three defined attributes. In essence, TreeNode behaves like a type-checked data structure. This subclass of HasStrictTraits ensures that any object attribute with required=True in its metadata must be passed as an argument on object initialization. These subclasses of HasTraits are provided as a convenience, and their use is completely optional. However, they do illustrate how easy it is to create subclasses with customized default attribute behavior if desired. This example creates a GUISlider class, whose __init__() method can accept a string label and either a trait definition or minimum, maximum, and initial values. If no trait definition is specified, one is constructed based on the max and min values. A trait attribute whose name is the value of label is added to the object, using the trait definition (whether specified or constructed). Thus, the label trait attribute on the GUISlider object is determined by the calling code, and added in the __init__() method using add_trait(). You can require that add_trait() must be used in order to add attributes to a class, by deriving the class from HasStrictTraits (see HasStrictTraits). When a class inherits from HasStrictTraits, the program cannot create a new attribute (either a trait attribute or a regular attribute) simply by assigning to it, as is normally the case in Python. In this case, add_trait() is the only way to create a new attribute for the class outside of the class definition. The Traits package supports declaring and implementing interfaces. An interface is an abstract data type that defines a set of attributes and methods that an object must have to work in a given situation. The interface says nothing about what the attributes or methods do, or how they do it; it just says that they have to be there. Interfaces in Traits are similar to those in Java. They can be used to declare a relationship among classes which have similar behavior but do not have an inheritance relationship. Like Traits in general, Traits interfaces don’t make anything possible that is not already possible in Python, but they can make relationships more explicit and enforced. Python programmers routinely use implicit, informal interfaces (what’s known as “duck typing”). Traits allows programmers to define explicit and formal interfaces, so that programmers reading the code can more easily understand what kinds of objects are actually intended to be used in a given situation.
""" Returns a string which is the name of an object. """ Interface classes serve primarily as documentation of the methods and attributes that the interface defines. In this case, a class that implements the IName interface must have a method named get_name(), which takes no arguments and returns a string. Do not include any implementation code in an interface declaration. However, the Traits package does not actually check to ensure that interfaces do not contain implementations. By convention, interface names have a capital ‘I’ at the beginning of the name. 0 (default): Does not check whether classes implement their declared interfaces. 1: Verifies that classes implement the interfaces they say they do, and logs a warning if they don’t. 2: Verifies that classes implement the interfaces they say they do, and raises an InterfaceError if they don’t. Using an interface class with an Instance trait definition declares that the trait accepts only values that implement the specified interface. Using the Supports traits, if the assigned object does not implement the interface, the Traits package may automatically substitute an adapter object that implements the specified interface. See Adaptation for more information. The adaptation features of Traits have been rewritten in v. 4.4.0 . See the migration guide below for details regarding changes in API. Adaptation is the process of transforming an object that does not implement a specific interface needed by a client into an object that does. In the adapter pattern, an object is wrapped in a second object, the adapter, that implements the target interface. Adaptation enables a programming style in which each component or service in an application defines an interface through which it would like to receive information. Objects that need to communicate with the component declare an adapter for that interface, as illustrated in the figure below. Adaptation allows decoupling the data model from the application components and services: introducing a new component in the application should not require modifying the data objects! Traits provides a package to make this pattern easy and automatic: In the traits.adaptation package, adapters from a protocol (type or interface) to another can be registered with a manager object. HasTraits classes can either explicitly request to adapt an object to a protocol, or they can define special traits that automatically invoke the adaptation manager whenever it is necessary. For example, if a Supports trait requires its values to implement interface IPrintable, and an object is assigned to it which is of class Image, which does not implement IPrintable, then Traits looks for an adapter from Image to IPrintable, and if one exists the adapter object is assigned to the trait. If necessary, a “chain” of adapter objects might be created, in order to perform the required adaptation. Protocols can be specified using any of those. Adapters can be chained, i.e., an object can be adapted to a target protocol as long as there is a sequence of adapters that can be used to transform it. Adaptation of an object to a protocol can be conditional, i.e. it may succeed or fail depending on the state of the object. The classes for the adapter, the origin, and the target protocols can be specified as strings, and are only loaded if they are required. The Traits package provides two classes for defining adapters, one for Traits adapters, Adapter, and one for for pure-Python adapters, PurePythonAdapter. These classes streamline the process of creating a new adapter class. They have a standard constructor that does not normally need to be overridden by subclasses. This constructor accepts one parameter, which is the object to be adapted, and assigns that object to an adaptee attribute (a trait in the case of Adapter). Declare which interfaces the adapter class implements on behalf of the object it is adapting. For example, if we are working with Traits Interface s, the adapter would be decorated with the provides() decorator. In the case of Python ABCs, the class would be a subclass of the abstract base class, or be registered with it. Implement the methods defined in the interfaces declared in the previous step. Usually, these methods are implemented using appropriate members on the adaptee object. For Traits adapters, define a trait attribute named adaptee that declares what type of object it is an adapter for. Usually, this is an Instance trait. Once an adapter class has been defined, it has to be registered with the adaptation manager using the register_factory() function. 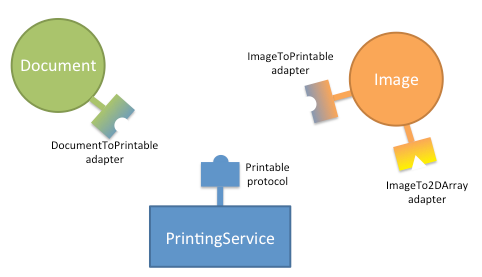 The register_factory() function takes as first argument the adapter class (or an adapter factory), followed by the protocol to be adapted (the one provided by the adaptee, from_protocol), and the protocol that it provides (to_protocol). # ... somewhere else at application startup. The first argument to the register_factory() function needs not be an adapter class, it can be, more generally, an adapter factory. An adapter factory can be any callable that accepts one positional argument, the adaptee object, and returns an adapter or None if the adaptation was not possible. Adapter factories allow flexibility in the adaptation process, as the result of adaptation may vary depending on the state of the adaptee object. A common use of adapter factories is to allow adaptation only if the state of the adaptee object allows it. The factory returns an adapter object if adaptation is possible, or None if it is not. # Declare that NDArrayToImage implements ImageABC.
""" An adapter factory from numpy arrays to the ImageABC protocol.""" Adapter classes are defined as described in the preceding sections, but you do not explicitly create instances of these classes. Instead, the function adapt() is used, giving the object that needs to be adapted and the target protocol. In some cases, no single adapter class is registered that adapts the object to the required interface, but a series of adapter classes exist that, together, perform the required adaptation. In such cases, the necessary set of adapter objects are created, and the “last” link in the chain, the one that actually implements the required interface, is returned. will return an instance of the HTMLDocumentToIPrintable adapter, as it is more specific than DocumentToIPrintable. (the default argument, None, is optional). Using the terminology introduced in this section, we can say that the Instance trait accepts values that provide the specified protocol. The Supports trait accepts values that support the specified protocol. The value of the trait after assignment is the possibly adapted value (i.e., it is the original assigned value if that provides the protocol, or is an adapter otherwise). The AdaptsTo trait also accepts values that support the specified protocol. Unlike Supports, AdaptsTo stores the original, unadapted value. If your application works with adaptation, it is natural to use the Supports trait in place of the Instance one in most cases. This will allow that application to be extended by adaptation in the future without changing the existing code, without having to invoke adaptation explicitly in your code.
""" Return text formatted with the given number of columns. """ """ A text document. """ """ Adapt TextDocument and provide IPrintable. """ # ---- Application starts here. # Create two text documents. # they are automatically adapted by Traits. The algorithm for finding a sequence of adapters adapting an object adaptee to a protocol to_protocol is based on a weighted graph. Nodes on the graphs are protocols (types or interfaces). Edges are adaptation offers that connect a offer.from_protocol to a offer.to_protocol. The algorithm finds the shortest weighted path between adaptee and to_protocol. Once a candidate path is found, it tries to create the chain of adapters using the factories in the adaptation offers that compose the path. If this fails because of conditional adaptation (i.e., an adapter factory returns None), the path is discarded and the algorithm looks for the next shortest path. Cycles in adaptation are avoided by only considering path were every adaptation offer is used at most once. The implementation of the adaptation mechanism changed in Traits 4.4.0 from one based on PyProtocols to a new, smaller, and more robust implementation. Code written against traits.protocols will continue to work, although the traits.protocols API has been deprecated and its members will log a warning the first time they are accessed. The traits.protocols package will be removed in Traits 5.0 . Use the traits.api.provides() decorator instead. Use the function traits.api.register_factory(), or the function traits.adaptation.api.register_offer() instead. It is no longer necessary to distinguish between “types”, “protocols”, and “objects”. This function was used occasionally to declare that an arbitrary type (e.g., dict) implements an interface. Users that use Python ABCs can use the register method for achieving the same result. Otherwise, use the function traits.adaptation.api.register_provides() that declares a “null” adapter to adapt the type to the interface. The adaptation mechanism does not explicitly support old-style classes. Adaptation might work in particular cases but is not guaranteed to work correctly in situations involving old-style classes. When used with Traits, the classes involved in adaptation are typically subclasses of HasTraits, in which case this is not an issue. The methods register_factory(), adapt(), etc. use a global adaptation manager, which is accessible through the function get_global_adaptation_manager(). The traits automatic adaptation features also use the global manager. Having a global adaptation manager can get you into trouble, for the usual reasons related to having a global state. If you want to have more control over adaptation, we recommend creating a new AdaptationManager instance, use it directly in your application, and set it as the global manager using set_global_adaptation_manager(). A common issue with the global manager arises in unittesting, where adapters registered in one test influence the outcome of other tests downstream. Tests relying on adaptation should make sure to reset the state of the global adapter using reset_global_adaptation_manager(). The predefined Property() trait factory function defines a Traits-based version of a Python property, with “getter” and “setter” methods. This type of trait provides a powerful technique for defining trait attributes whose values depend on the state of other object attributes. In particular, this can be very useful for creating synthetic trait attributes which are editable or displayable in a TraitUI view. All parameters are optional, including the fget “getter”, fvalidate “validator” and fset “setter” methods. If no parameters are specified, then the trait looks for and uses methods on the same class as the attribute that the trait is assigned to, with names of the form _get_name(), _validate_name() and _set_name(), where name is the name of the trait attribute. This line defines a trait whose value is validated by the Code trait, and whose getter and setter methods are defined elsewhere on the same class. A function with the appropriate name is not defined on the class. The force option is True, (which requires the Property() factory function to ignore functions on the class) and one of the access functions was not specified in the arguments. In some cases, the cost of computing the value of a property trait attribute may be very high. In such cases, it is a good idea to cache the most recently computed value, and to return it as the property value without recomputing it. When a change occurs in one of the attributes on which the cached value depends, the cache should be cleared, and the property value should be recomputed the next time its value is requested. One strategy to accomplish caching would be to use a private attribute for the cached value, and notification listener methods on the attributes that are depended on. However, to simplify the situation, Property traits support a @cached_property decorator and depends_on metadata. Use @cached_property to indicate that a getter method’s return value should be cached. Use depends_on to indicate the other attributes that the property depends on. The @cached_property decorator takes no arguments. Place it on the line preceding the property’s getter method. The depends_on metadata attribute accepts extended trait references, using the same syntax as the on_trait_change() method’s name parameter, described in The name Parameter. As a result, it can take values that specify attributes on referenced objects, multiple attributes, or attributes that are selected based on their metadata attributes. In version 3.0, the Traits package provides __getstate__() and __setstate__() methods on HasTraits, to implement traits-aware policies for serialization and deserialization (i.e., pickling and unpickling). Often, you may wish to control for a HasTraits subclass which parts of an instance’s state are saved, and which are discarded. A typical approach is to define a __getstate__() method that copies the object’s __dict__ attribute, and deletes those items that should not be saved. This approach works, but can have drawbacks, especially related to inheritance. The HasTraits __getstate__() method uses a more generic approach, which developers can customize through the use of traits metadata attributes, often without needing to override or define a __getstate__() method in their application classes. In particular, the HasTraits __getstate__() method discards the values of all trait attributes that have the transient metadata attribute set to True, and saves all other trait attributes. So, to mark which trait values should not be saved, you set transient to True in the metadata for those trait attributes. The benefits of this approach are that you do not need to override __getstate__(), and that the metadata helps document the pickling behavior of the class. In this example, the DataBase class’s file trait is marked as transient because it normally contains an open file handle used to access a data base. Since file handles typically cannot be pickled and restored, the file handle should not be saved as part of the object’s persistent state. Normally, the file handle would be re-opened by application code after the object has been restored from its persisted state. Delegate traits that do not have a local value overriding the delegation. Delegate traits with a local value are non-transient, i.e., they are serialized. (See DelegatesTo) You can mark a Delegate trait as transient if you do not want its value to ever be serialized. In general, try to avoid overriding __getstate__() in subclasses of HasTraits. Instead, mark traits that should not be pickled with transient = True metadata. The __setstate__() method of HasTraits differs from the default Python behavior in one important respect: it explicitly sets the value of each attribute using the values from the state dictionary, rather than simply storing or copying the entire state dictionary to its __dict__ attribute. While slower, this strategy has the advantage of generating trait change notifications for each attribute. These notifications are important for classes that rely on them to ensure that their internal object state remains consistent and up to date. If you’re manually creating state dictionaries for consumption by __setstate__(), you should be aware of an additional implementation detail: when pickling, the HasTraits __getstate__() method returns a dictionary with an extra '__traits_version__' key giving the version of Traits used at pickling time. If this key is not present when unpickling, the HasTraits __setstate__() method falls back to a compatibility mode and may not restore the state correctly. For the same reason, if you’re overriding __getstate__(), you should be careful to make the appropriate super(..., self).__getstate__() call. Call the __setstate__() super method (for example, with an empty state dictionary). Call the HasTraits class’s private _init_trait_listeners() method; this method has no parameters and does not return a result. The HasTraits class defines a number of methods, which are available to any class derived from it, i.e., any class that uses trait attributes. This section provides examples of a sampling of these methods. Refer to the Traits API Reference for a complete list of HasTraits methods. This method adds a trait attribute to an object dynamically, after the object has been created. For more information, see Per-Object Trait Attributes. This method copies trait attributes from one object to another. It can copy specified attributes, all explicitly defined trait attributes, or all explicitly and implicitly defined trait attributes on the source object. This method is useful if you want to allow a user to edit a clone of an object, so that changes are made permanent only when the user commits them. In such a case, you might clone an object and its trait attributes; allow the user to modify the clone; and then re-clone only the trait attributes back to the original object when the user commits changes. The add_class_trait() method is a class method, while the preceding HasTraits methods are instance methods. This method is very similar to the add_trait() instance method. The difference is that adding a trait attribute by using add_class_trait() is the same as having declared the trait as part of the class definition. That is, any trait attribute added using add_class_trait() is defined in every subsequently-created instance of the class, and in any subsequently-defined subclasses of the class. In contrast, the add_trait() method adds the specified trait attribute only to the object instance it is applied to. In addition, if the name of the trait attribute ends with a ‘_’, then a new (or replacement) prefix rule is added to the class definition, just as if the prefix rule had been specified statically in the class definition. It is not possible to define new prefix rules using the add_trait() method. One of the main uses of the add_class_trait() method is to add trait attribute definitions that could not be defined statically as part of the body of the class definition. This occurs, for example, when two classes with trait attributes are being defined and each class has a trait attribute that should contain a reference to the other. For the class that occurs first in lexical order, it is not possible to define the trait attribute that references the other class, since the class it needs to refer to has not yet been defined. As it stands, this example will not run because the hatched_from attribute references the Egg class, which has not yet been defined. Reversing the definition order of the classes does not fix the problem, because then the created_by trait references the Chicken class, which has not yet been defined. Using traits can potentially impose a performance penalty on attribute access over and above that of normal Python attributes. For the most part, this penalty, if any, is small, because the core of the Traits package is written in C, just like the Python interpreter. In fact, for some common cases, subclasses of HasTraits can actually have the same or better performance than old or new style Python classes. Setting a value: Depends upon the complexity of the validation tests performed by the trait definition. Many of the predefined trait handlers defined in the Traits package support fast C-level validation. For most of these, the cost of validation is usually negligible. For other trait handlers, with Python-level validation methods, the cost can be quite a bit higher. Getting the default value: Cost of following the deferral chain. The chain is resolved at the C level, and is quite fast, but its cost is linear with the number of deferral links that must be followed to find the default value for the trait. Getting an explicitly assigned value for a delegate: Cost of following the deferral chain. Setting: Cost of following the deferral chain plus the cost of performing the validation of the new value. The preceding discussions about deferral chain following and fast versus slow validation apply here as well. In a typical application scenario, where attributes are read more often than they are written, and deferral is not used, the impact of using traits is often minimal, because the only cost occurs when attributes are assigned and validated. The worst case scenario occurs when deferral is used heavily, either for delegation, or for prototyping to provide attributes with default values that are seldom changed. In this case, the cost of frequently following deferral chains may impose a measurable performance detriment on the application. Of course, this is offset by the convenience and flexibility provided by the deferral model. As with any powerful tool, it is best to understand its strengths and weaknesses and apply that understanding in determining when use of the tool is justified and appropriate.